In addition to winning last year's Belmont Stakes with Drosselmeyer, trainer Bill Mott captured the Grade 1 Foxwoods Just a Game with Proviso on the Belmont Stakes undercard. While Mott will not have a Belmont Stakes starter in 2011, he'll have the opportunity to win the Foxwoods Just a Game for the second consecutive year as he will send out Aviate on Saturday in the $400,000 race for fillies and mares at one mile on the turf. Like Proviso, Aviate is a Juddmonte Farms homebred who began her career overseas and enters the Foxwoods Just a Game off a graded stakes victory outside New York . Aviate, a Group 3 winner in England who also raced in Ireland and France , has made two starts for Mott since arriving in the United States , finishing third in the Grade 3 Honeyfox at Gulfstream Park on March 5 and erasing a 10-length deficit to win the Grade 2 Distaff Turf Mile at Churcill Downs on May 7. The Foxwoods Just a Game will be her third straight start at one mile. Hall of Fame jockey Kent Desormeaux will ride Aviate, the 5-2 morning-line favorite, from post position 2. Trainer H. Graham Motion can duplicate Mott's feat as he will send out Gypsy's Warning in the Foxwoods Just a Game in addition to saddling Kentucky Derby winner Animal Kingdom for the Belmont Stakes. Gypsy's Warning hails from South Africa , where she won three stakes, including two Group 1 events prior to being acquired by Animal Kingdom's owner, Team Valor International, who sent her to the United States . Since the move, the expatriate is 2-0-2 in seven starts, including wins in the Grade 3 Eatontown Handicap at Monmouth Park in May 2010 and the Grade 1 Matriarch at Hollywood Park in November. In her lone start of 2011, Gypsy's Warning finished seventh over yielding turf in Keeneland's Grade 2 Jenny Wiley on April 16 in what Motion described as a “throw-out” performance. Gypsy's Warning will leave from the rail with Julien Leparoux aboard as the 5-1 morning-line third choice. AJ Suited Racing Stable's Much Rejoicing steps up in class and stretches out off a triumph in the six-furlong Glia overnight stakes at Belmont Park on May 13. It was the first start on turf for daughter of Soaring Softly, who won the 1999 Grade 1 Flower Bowl at Belmont Park before she concluded her career with a triumph in that year's Grade 1 Breeders' Cup Filly & Mare Turf at Gulfstream Park. Much Rejoicing's two previous starts in 2011 came in route races, a one-mile, off-the-turf optional claimer at Gulfstream in March and a sixth in the Grade 3, 1 1/16-mile Doubledogdare over Keeneland's Polytrack on April 22. Alan Garcia has the call aboard Much Rejoicing, 12-1 on the morning line, from post 8. Amen Hallelujah, a two-time Grade 2 winner on the main track, will try turf for the first time in the Foxwoods Just a Game. 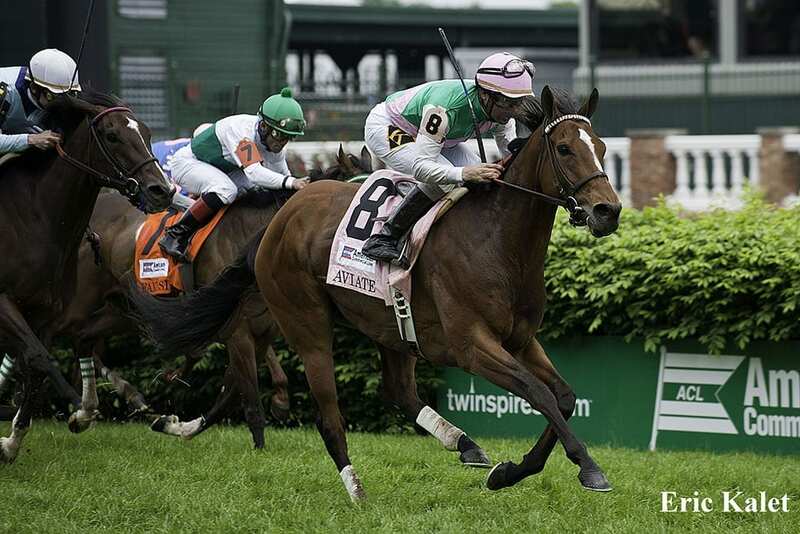 She seeks her first victory of 2011, having placed in four graded stakes this year, including a second in the Grade 1 Madison at Keeneland on April 14 and a third in the Grade 1 Humana Distaff at Churchill Downs on May 7 in her two most recent starts. Trained by Rick Dutrow, Jr., the IEAH Stables color-bearer will be stretching out from seven furlongs. John Velazquez will ride Amen Hallelujah from post 3. The Foxwoods Just a Game field also includes graded stakes winners C. S. Silk, Strike the Bell , Fantasia, Cherokee Queen, and Justaroundmidnight. This entry was posted in Racing and tagged Amen Hallelujah, Aviate, bill mott, Graham Motion, Gypsy's Warning, James Toner, Just A Game Stakes, Much Rejoicing, rick dutrow, Strike the Bell by Paulick Report Staff. Bookmark the permalink.